I'm a chicken lover through and through. But I am always looking for meal options that are different, just to mix it up. 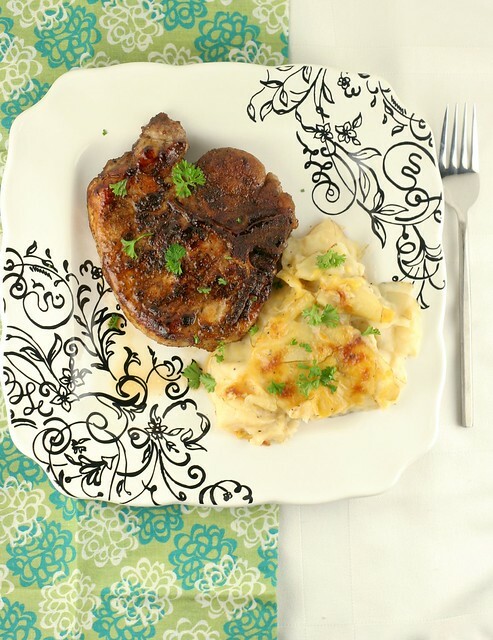 These pork chops are just that. Bone-in, thick, center cut pork chops are rubbed down with a spice rub, seared in a skillet then baked until tender. The sugar in the spice rub caramelizes to form a crust on the outside. They are spicy and sweet and delicious. I served these with blue cheese potato gratin and it was the perfect, easy weeknight meal. 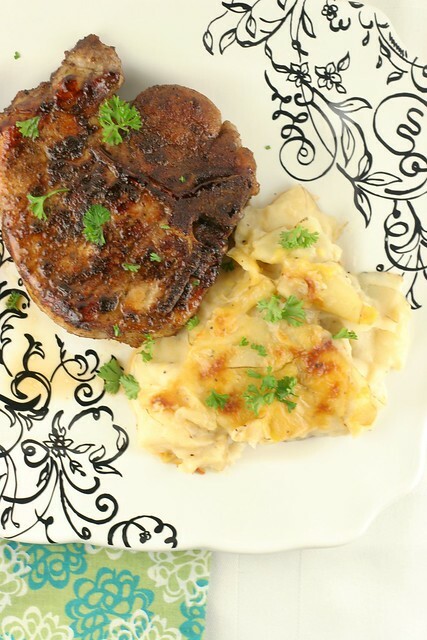 It couldn't get any easier to make these pork chops. 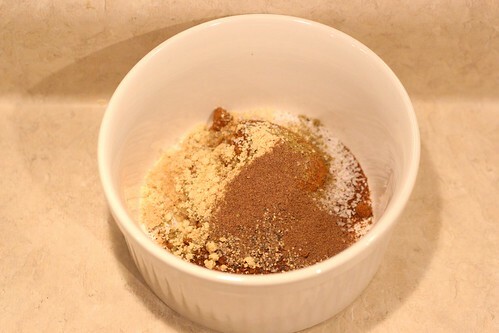 Just combine the spices in a little bowl, then take your pork chops and rub them down. Get all up in those pretty hunks of meat. Rub it around on all sides and then let them sit, rest and calm down after their deep tissue massage. The spices will soak in and marinade the meat. Only good things can happen from this. Get a skillet screaming hot with a little oil. Sear them for about 2 minutes on each side to get a nice crust. Then pop the skillet in the oven and bake until they're cooked through. This is the secret for tender, delicious pork chops. You want to be really careful with pork. Make sure it's cooked all the way through until a meat thermometer reaches 155 - 160 degrees. 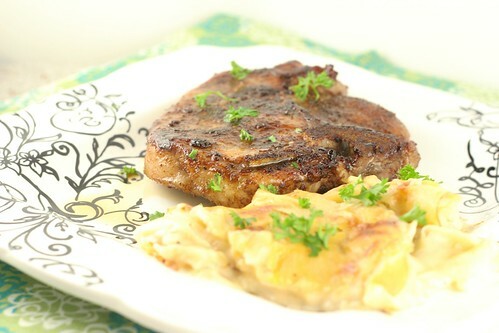 After it rests for a few minutes, you have the most flavorful pork chops you've ever put in your mouth. The spice rub is so complex with flavors from brown sugar, ground allspice and paprika - perfectly sweet and spicy at the same time. Heat an oven-safe skillet over high heat with oil. Preheat oven to 375 degrees. Combine brown sugar, salt, paprika, chili powder, garlic powder, ground cumin, dry mustard, ground allspice and black pepper in an small bowl until well mixed. Rub both pork chops with equal amounts of spice rub. Really get into the grooves of the meat and rub on all sides. Let the meat rest for 3-4 minutes before searing. 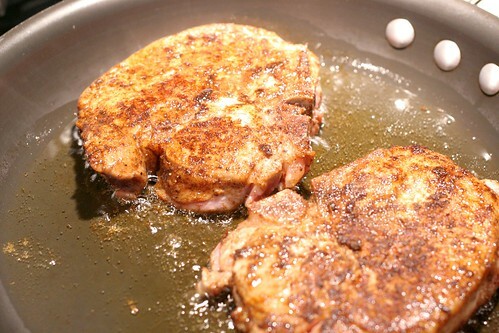 Put pork chops in skillet, sear for 2 minutes on each side to form crust. Put skillet in oven for 10-12 minutes, or until a meat thermometer reaches 154 to 160 degrees. Serve immediately. I love, love, love pork chops! Nate won't eat them, so I may have to just fry a couple up for myself and give him some chicken. These look so juicy and delicious! I'm always worried I'll dry them out. 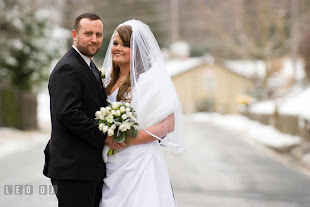 How do you make sure the outside isn't too dry when the inside is finally the right temp? Amy, they were really juicy! I think the best way to cook them is the way I described - just sear them (both sides) on the stove top in a super hot skillet, then finish them in the oven for like 10 minutes. A meat thermometer is the best kitchen tool - use that to determine when the meat is done. That way, you're not cutting into it before it's done and letting all those juices run out! Such a waste! The outside gets a nice crust and the inside is tender. There is sugar in the spice rub, so that helps caramelize the outside - so it's not too dry. Oh and I'm sure you know this, but letting them rest for 6-8 minutes after cooking helps too. the only time I have had potatoes au gratin and pork chops (together, but also the only time i have had either, somehow) was at the cafeteria of a hospital where I used to volunteer. this looks so, so much better. I will have to try making both of them! Thanks for the feedback, Jenna :) K, I'm gonna give 'em a try this week!